This series of articles is intended to help court reporting students and working reporters/captioners/CART providers in the never ending quest to find the ultimate CAT software. In an effort to help with that quest, I have contacted working professionals in the field (not just (non-reporting) trainers) and asked them to tell you (yes, you!) why they use the CAT software they use -- their likes, dislikes, etc. ... and I managed to convince Phil Stillerman, a recently retired official in New York, and Darlene Pino, a long-time Winner user (and Beta tester) to write the ProCAT Winner article. I recently (September 30, 2008) retired from my job as an official with the New York State Family Court in both Dutchess and Rockland Counties. I also freelanced some evenings doing DWI hearings, parole and probation violation hearings, misdemeanor trials, various public hearing (town board, zoning board, zoning board of appeals, planning board, etc.) for a few neighboring towns. In the '90s I picked up a used Xscribe system. I tried it for a number of months and just could not remember the command structure to do various things like transfer my notes from the steno machine to the computer or the editing commands. The system sits in my garage to this day as a major dust collector. 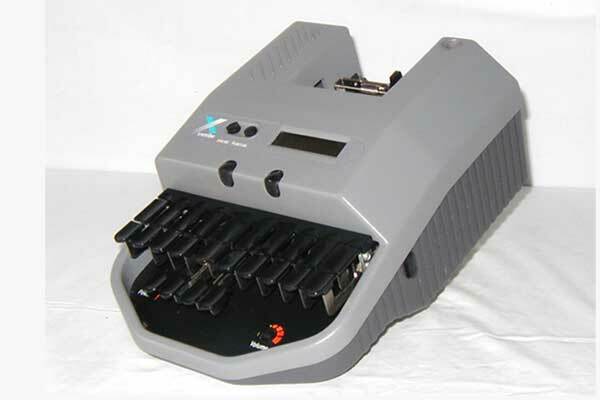 In 2000 or so I wearied of pounding away on my manual Stenograph machine and then having to transcribe the cases, first using an IBM Selectric typewriter, then a word processing program. With the help of another reporter I met online in one of the CR forums I narrowed my search to either ProCAT Winner or AristoCAT when I met with this other reporter in New Orleans at the convention, and she helped me make the final decision to go with ProCAT. Thank you, Mary Ann Payonk. My selection criteria included something easy to learn, since I'm not that computer-savvy. I didn't need or want all of the bells and whistles many of the CAT systems offered. 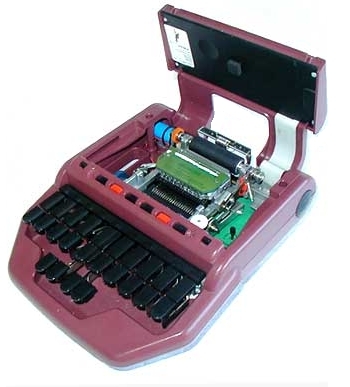 I wanted a system that would take my steno notes and transcribe them for me, period. At the time I didn't realize that unless you're a perfect writer, no system will do that. I wanted real-time capability even though I knew I would never be a true real-timer. ProCAT Winner xp gives both ease of use and more optional bells and whistles than you can imagine. While in New Orleans I ordered ProCAT's Winner xp Version 8.0, and their Flash writer. I received the full system a few weeks later. Since I had no dictionary to install the first thing I remember being instructed to do was to write my dictionary. 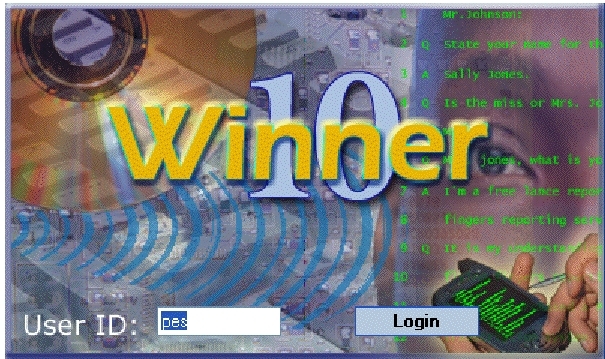 Winner includes a flash-screen-type system of words and phrases -- including some Latin and medical words and phrase -- for me to steno in to start building my dictionary. One of the few instructions concerning that, as I remember it, was to just "write away." There is an option to tell the computer that you write the same thing different ways. It was a time consuming process, but not taxing. And, it does not have to be completed at one sitting. But once that was done, then and only then could I start using the system. You can also import an already existing dictionary from another CAT system to ProCAT. I didn't start out realtiming. That meant that at the end of every day I had to take the Flash's SRAM card, place it in the computer, and transfer the day's take to the computer, then have the computer translate that transfer. That too was time-consuming, but not hard to do, although I always managed to have problems with the physical insertion of the SRAM card correctly into the computer slot (but, that's me, folks, not the system). The SRAM card hold about 1500 pages (or so they advertise). I have never verified that. But, that would be an average of five days' of work. After I started realtiming I no longer had to transfer the day's work from the Flash to the computer since it was already in the computer. The SRAM card became a back-up copy until I got the opportunity to back everything up onto floppies, CDs, and an external hard drive. And, of course, there's the option of having your paper back-up (or not). Dictionary building is easy. You can make as many dictionaries (medical, legal, construction) as you want. You can easily edit your dictionary entries, add and delete entries. During the editing mode you save your new dictionary entries either directly to your personal dictionary or to a temporary dictionary called the Global dictionary. You can then, at your leisure, review and edit the Global dictionary and transfer the entries to your permanent dictionaries. It's a very simple process. I've been one of the BETA-testers for the latest update, which is Version 10. ProCAT claims that they Winner xp is compatible with the VISTA operating system. I'm using the XP Home operating system SP2. I will not upgrade to SP3 since I don't trust its stability based on what I have heard and read. I have found no conflicts with Spy-Bot, Aadware, BitDefender, AVG (free), or MS MalWare. At first I used McAfee and then Norton, didn't find any conflicts running them with Winner xp, but I just didn't like McAfee or Norton. Vista operating system requirements are listed on the ProCAT website and are similar to Winner xp requirements: 2.3 Ghz Intel Core 2 Duo; 1.8 - 2.0 Ghz Intel Core 2 Duo; 2 GB RAM; HDD, 60 Gb minimum capacity room recording, 20 Gb minimum; Audio, built-in mic and headphone jacks or external sound board such as VXI. I do not use the Stylus, but I understand the Stylus is wireless. I believe the Stylus can connect to the computer via a data transfer cord (looks like telephone wire, but isn't) or through a wireless connection. As I understand it you would first have to "pre-program" the computer by installing the security key, and data transfer cord, after that you can go "wireless." It's suggested, however, that you always keep your security key and data cord with you, just in case. The cost for replacement of the security key if damaged or lost is the cost of the software (to prevent fraud, unauthorized use) but with the insurance policy (you should have anyway) you're covered. I believe NCRA still offers such a policy. Bluetooth can be used instead, and I've been told it works well with StenoCast. Depending on what computer you have you might need a USB to Serial Adapter to connect your Flash or Stylus). I've been using a cheap Radio Shack adapter. After initial problems (user error) and some technical advice from ProCAT I've had no problems. To realtime to workstations (judges, lawyers) via Denoto (provided by ProCAT) there are cables and possibly adapters that are required. Since I don't provide realtime to judges or attorneys, I've never gotten involved in that. So far as student versions go I have never tried them. ProCAT advertises that the costs of their student version goes 100% towards the trade-in and purchase (or upgrade and purchase) to their professional version. As I said earlier, I don't use all the bells and whistles offered, but there is the capability to create MACROs and increase the ease of use. You can adjust the auto save to any length of time you want. I have mine set to every five minutes. There is no interference between the auto-save and realtiming. Editing from the steno machine is available, but I don't use that feature. Automatic back-up files are made every time the autosave is activated, or every time the user activates the manual save (hit F2). The system actually makes three saved copies of your translation so if you accidentally delete one, you have the other two; plus, if you use paper, you have that as a back-up. Conflict resolution is handled by Artificial Intelligence, or the user. The system learns from your style of writing and makes the choices for you if you wish. If a brief has more than one definition (conflict) it will show on the screen in a user-friendly color. You then right-click and make your choice from the drop-down menu. My co-author Darlene Pino, another Beta-tester and federal official reporter, is a realtime writer of many years. She switched to ProCAT software back in 1990. Some of the wonderful features Darlene enjoys using are the "suggest translations," and the artificial intelligence that makes good, logical, choices for any mis-strokes. During realtime it offers on-the-fly suggested shorter strokes for your steno phrases, the ability to tell it to drag or drop a key that is commonly mis-stroked, such as a final €œ'L' or initial 'S'; automatic punctuation, and screen zoom for larger text during editing reducing eye strain. There are multiple import/export formats: RTF, ASCII, and PDF are some of them. Dictionary editing in realtime is possible, as is ADD and DELETE, assuming there is a long-enough pause in the proceedings. As I understand it you can import from other software, although I've never done it. ProCAT also has a VR (voice recognition) version of their software. Updates to the software are easily downloaded and self-install from their website or via disk. Archiving and unarchiving are simple and accurate, and makes it easy to send files to scopists and proofers, as well as emailing transcripts to the attorneys. Technical support is not free, but is close to being excellent. Tech support is available by phone, email, or going to their websites (one for regular users, a different one for BETA testers). Their technicians are knowledgeable and friendly. If they don't know the answer to your problem, or have it readily available, they tell you (not snow you) and when they get the answer (if they do, or don't) they get back to you in a timely fashion. If the technicians can't resolve the problem they refer it to a teach of programmers who try to resolve the problem. So far as I know, from reading the forums, they've resolved all the problems. Training is barely necessary if you have some computer knowledge. You most likely will need help to set up your page-format(s) the first time, and that can be obtained by a call in to tech support if you can't get the information on line The first time you call in be sure that you have your computer specifications handy (even if ProCAT sold you the computer). My experience is that their manual has been lacking in clear explanations but that may just be me, and my lack of computer knowledge. It has not been updated for the latest software release (Version 10) but as of this date they are still refining it. We (BETA testers) are still making suggestions, so an updated manual may not yet be the way to go. They do offer periodic live training sessions in major metropolitan geographic areas and you can obtain CEUs for NCRA and state associations. Their website, http://www.procat.com, is very clear in what's offered for captioning and scopists. All in all, ProCAT Winner is a great buy and highly recommended for freelance, officials, realtimers, captioners, and CART. It is very easy to use, and is compatible with most writers, and software that the attorneys use.